Morotai Island is an island and definitive regency in Halmahera, North Maluku, which is the Northeast Island in Indonesia. During the 15th century and 16th, Morotai was under the powerful influence of the Sultanate of Ternate. This is the core of a large area called the Moro, which include coastal islands of Halmahera and close to Morotai to the south. This island became the airfield for the Japanese during World War II. This island was taken over by the force of United States in September 1944, and being used as the basis for the Allied attack to the Philippines in early 1945, and to the east of Borneo in May and June in the same year. This was a base for attacks to Java in October 1945 which was abandoned after the Japanese surrender in August. For the Allies, Morotai Airport was a multi-entrance system (multi-gate system) from the Pacific. Morotai was chosen by U.S. because of the geographic, which was very strategic in the Asia Pacific region. In fact, Morotai able to bring victory for U.S. troops to defeat the soldiers of Nippon. 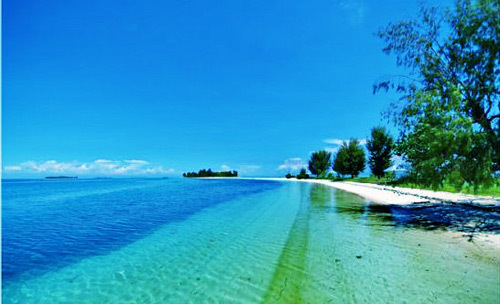 Beside the historical background, Morotai is also has potential destination like the beaches. The visitors can do diving or fishing in Dodola Marine park which is located in Small Dodola and Large Dodola island. You can also enjoy panoramic views of white sandy beaches along the 16 km. Meanwhile, on the island of Pulau Ngelengele Besar and Pulau Ngelengele Kecil (both located in the Western District of South Morotai and is about five miles from Port Daruba, Morotai), travelers can pamper themself to a white sandy beach, tropical sun and blue sea. The people of Morotai are mostly do farming and fishing, while the others are trading, to be civilian officer and police officer. Type of food crop on the island of Morotai are rice, maize, cassava, sweet potatoes, peanuts, mung beans, soybeans, fruits and vegetables. To go to Morotai Island can only be reached by sea transportation to the Daruba City. Travel to Morotai can be reached by speed boat from Ternate to Sidangoli with one hour travel time, then we can use vehicles from Tobelo with three hours of travel time, and from Tobelo we can use speedboat to Morotai with travel time of 1.5 hours.